Find Favorites is a simple tool that will help you to locate a specific web address among you favorites. Many times you may want to access a website, that you know that is in the favorite on your browser, but you just can't manage to find it. With Find Favorites you will have a list with all the links, and you will be able to search for a specific address. It is very simple to use: you have to input a word in the search box and Find Favorites will show a list with the links. 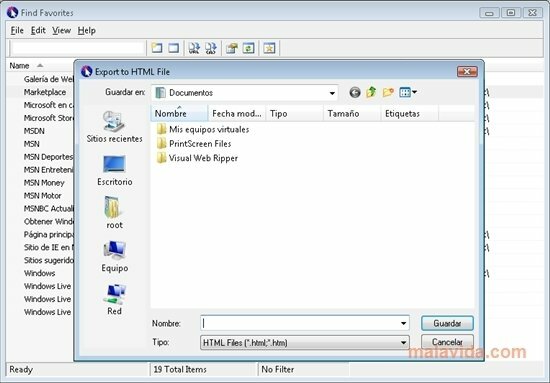 In this list you will see the name you have given the favorite, the web address, and the folder where it has been stored. From this list you will be able to access with a single click on the website, or reorder your favorites in your folders. Find Favorites also has a button to update the favorites list and you will be able to export the list as an HTML file. The application will also make it easy for you to copy and paste the URL address or to eliminate those that you don't want. Manage to have all your favorites ordered and easily find them with Find Favorites.